Off to the left is an abandoned barn and silo, a silent reminder that this was active farmland since at least the 18th century, when famed British landowner Lord Fairfax acquired much of what is now northern Virginia. George Washington, who worked as a surveyor for Fairfax, then briefly owned the property, which he purchased from Lord Fairfax, for whom he worked as a surveyor prior to the French and Indian War. 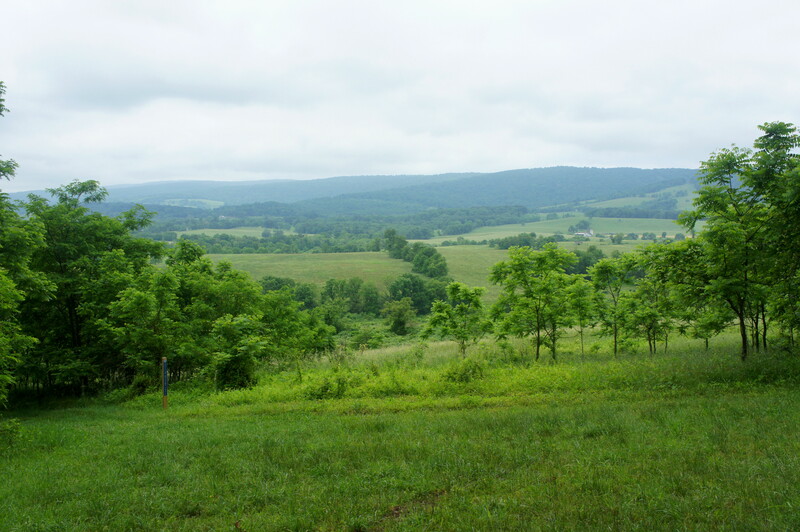 Since then, it has passed through several families before being endowed to Sky Meadows State Park in 1991. 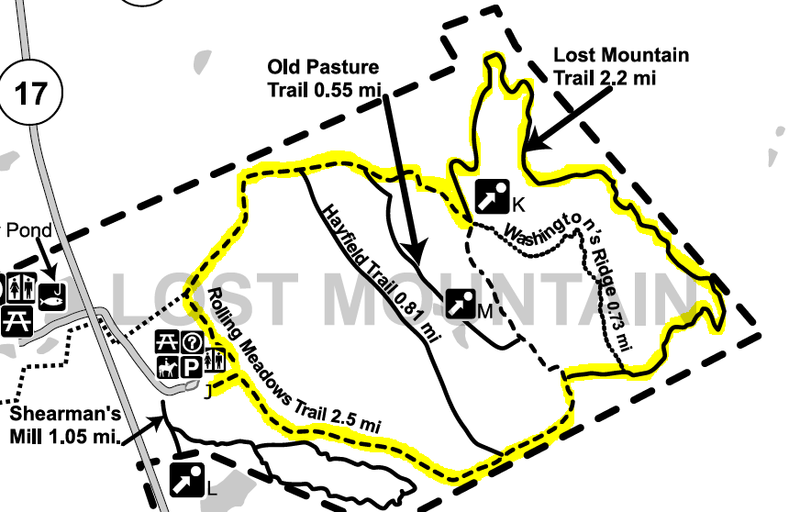 Fast forwarding to today…two paths take off from the Lost Mountain Trailhead, including the 1-mile Shearman’s Mill Trail and the 2.5-mile Rolling Meadows Trail. Take the latter, which begins just to the right of the wooden trail kiosk. One hundred yards down the gravel track, the trail splits; bear right, covering the subsequent loop in a counter-clockwise direction. From here, the Rolling Meadows Trail edges southeast, following an old, overgrown road bed. Thick shrubs and leafy trees flank the right side, while fencing separates the trail from the old farmland on the left. Around ½ mile from the start, the trail cuts diagonally left across the grassy pasture, climbing around 40 feet, then passes through an open gate. 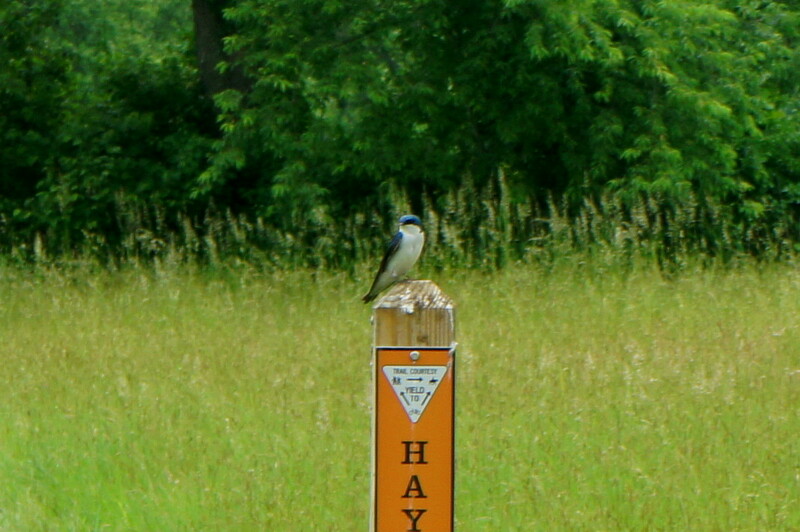 Look for bluebirds, which abound in these meadows. Back at the tree line, stay right at the trail fork, remaining on the blue-blazed Rolling Meadows Trail as the Hayfield Trail bears left. Steps later, traverse the creek bed, the first of two crossings on the hike. From here the trail climbs gently and traces a right-hand bend across a field of shrubs and thorns—overgrowth that suggests this former farmland was abandoned long ago. 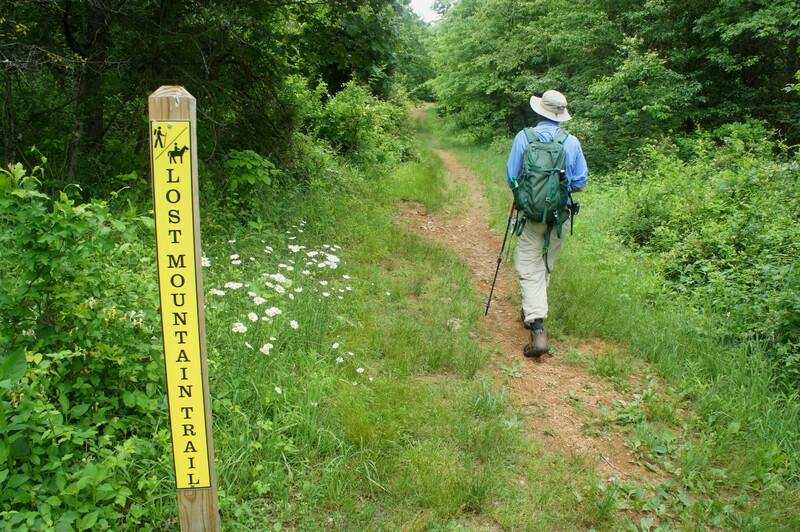 At one mile, the trail reaches another fork; bear right again, turning onto the yellow-blazed Lost Mountain Trail. 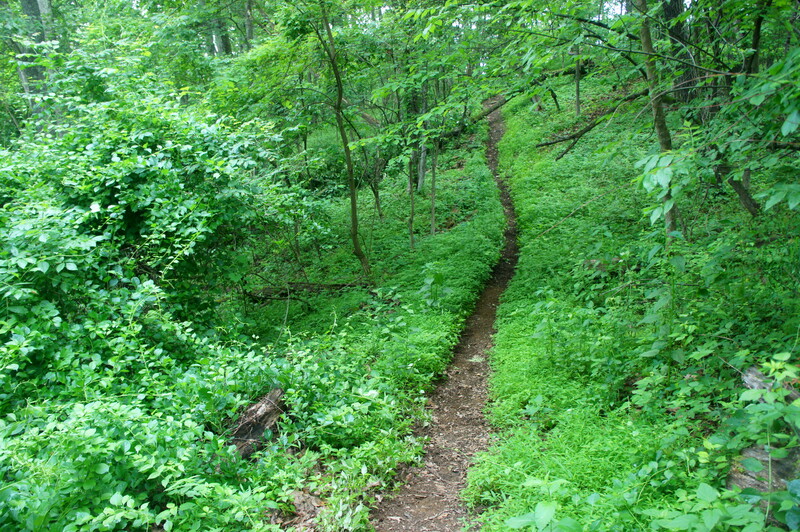 Dashing into the woods, the footpath thins to a singletrack and begins to climb the western flank of Lost Mountain. Gradual at first, the incline steepens after passing yet another junction (Washington’s Ridge Trail bears off to the left). After climbing for 1/3 mile, the trail tops out at about 870 feet, bears north, and begins to gradually descend the ridgeline atop Lost Mountain. The highest point is still ahead, however, as the trail begins to climb to a second peak at 1.9 miles. Not that the height makes much of a difference…Lost Mountain is blanketed in trees, severely limiting views in the summer. At 2.2 miles, the hike reaches 1,036 feet, a stone’s throw away from the summit, and then begins to drop. Suddenly, there is sun ahead: a tree cut to facilitate the passage of power lines allows for some limited vistas to the west. The power lines also form the northern bound for the hike, meaning the trail quickly doubles back, reenters the woods, and heads southwest. The trail drops around 275 feet in around a half-mile, reaching a four-way trail junction at 2.8 miles. 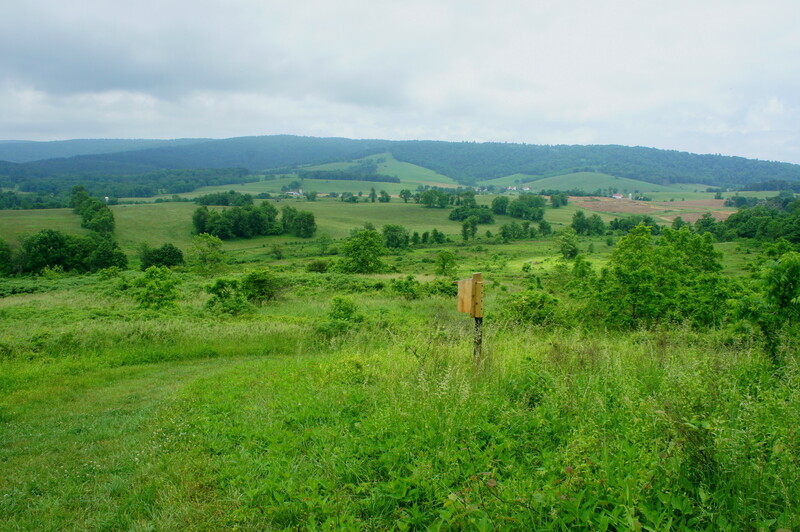 This point is also the highlight of the hike, as a break in the trees offers a fine view of Crooked Run Valley and the Blue Ridge Mountains to the west (toward the rest of Sky Meadows State Park). A wooden bench offers the chance to sit and take a break after the moderately strenuous traverse of Lost Mountain. 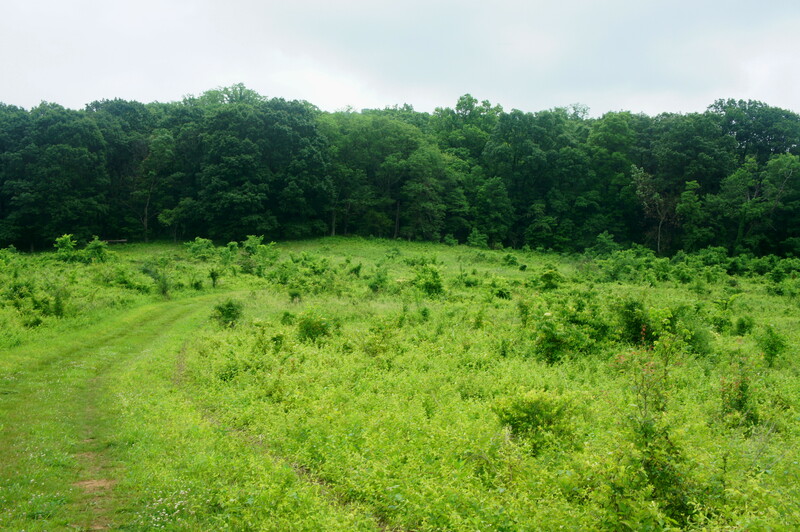 With the Lost Mountain Trail ending here, head right at the fork on the blue-blazed Rolling Meadows Trail, which gradually descends another 150 feet as it skirts the edge of the shrublands on the left. 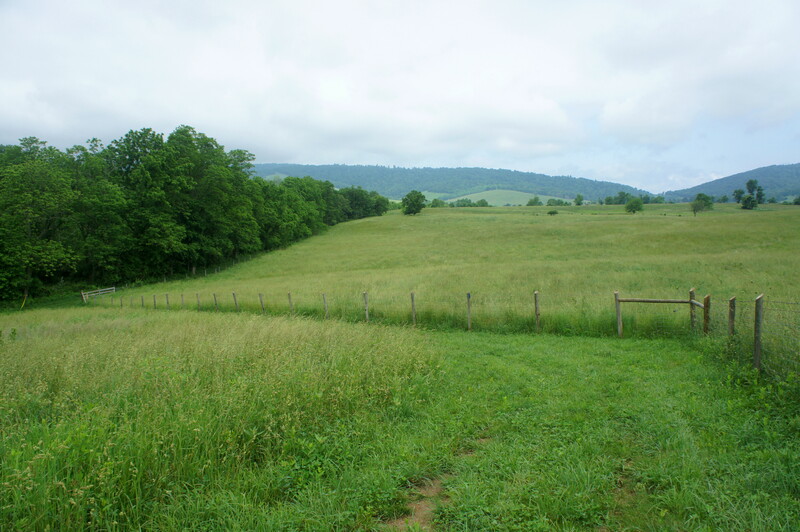 Stay right at the trail fork at 3.1 miles (the northern end of the Old Pasture Trail), then cross the open field. At 3.3 miles, the wide path crosses the creek a second time. Stay right again at the next trail junction (with the Hayfield Trail) and bound up the knoll as the trail enters the final stretch. 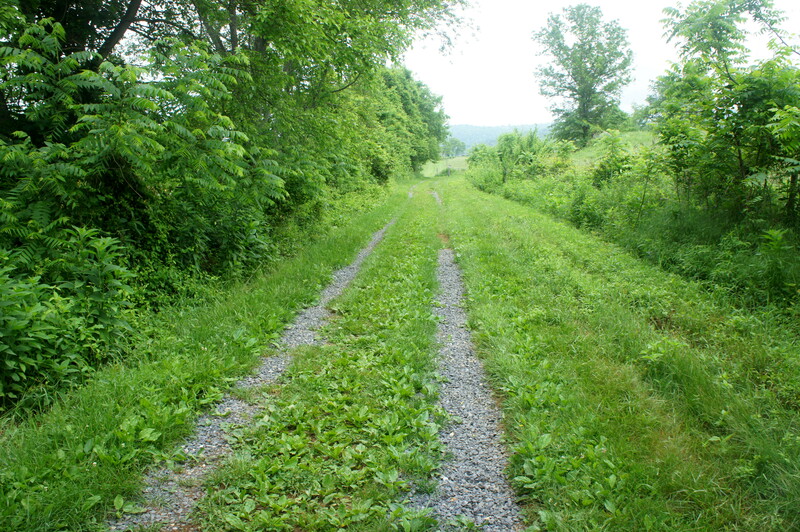 Follow a straightaway for 300 yards, then take a left at the penultimate trail fork, passing an old shed on the right. One hundred yards from the end, take a right at the original trail junction and retrace your steps back to the trailhead. Allot 2-3 hours for this moderately difficult circuit hike. 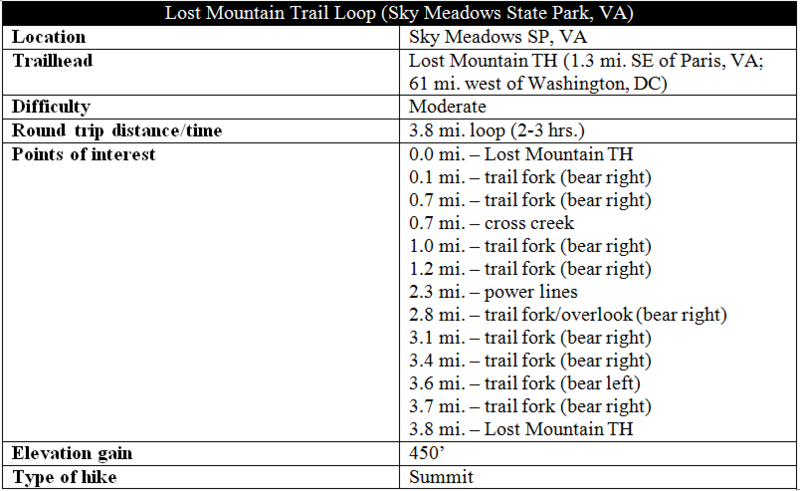 This entry was posted in Moderate Hikes, Sky Meadows State Park, Virginia and tagged loop hike, Lost Mountain, Lost Mountain Trail, meadow, Rolling Meadows Trail, Sky Meadows, Virginia. Bookmark the permalink.